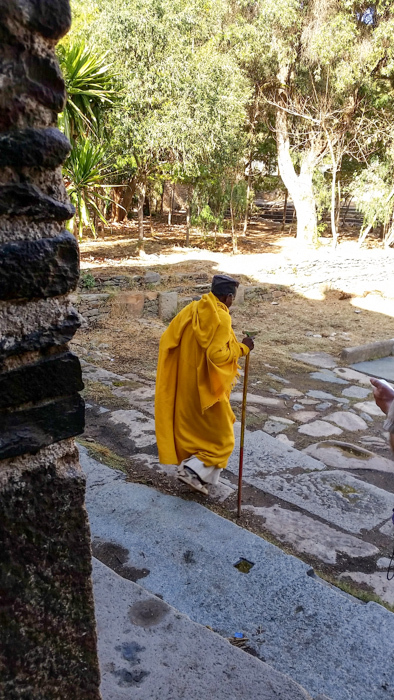 This morning my tour guide began to explore Aksum with me as a great riddle to be solved or a mystery of lore to lead to truth. 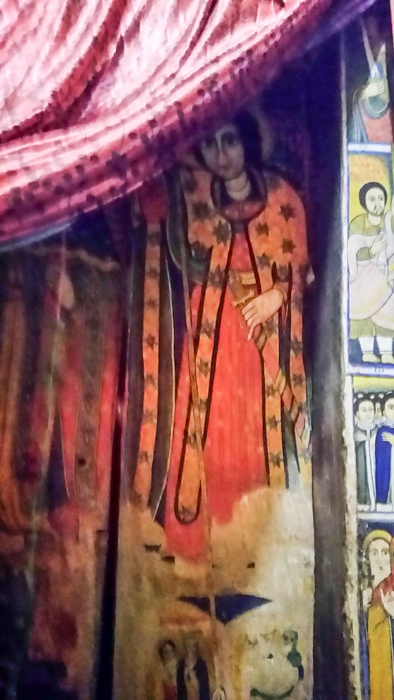 Was Aksum home of the Queen of Sheba? 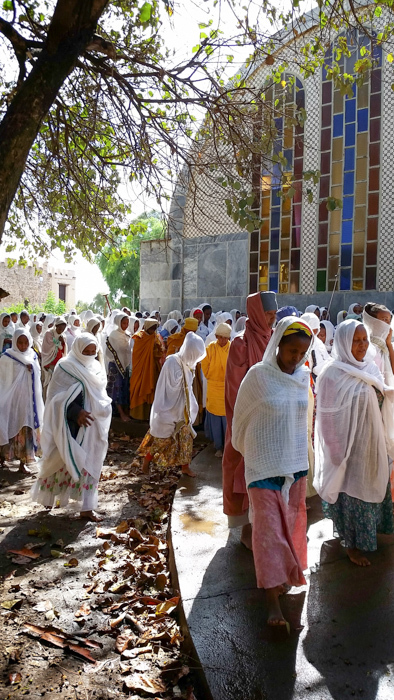 Could Aksum be the final resting place of the Ark of the Covenant? So much is yet to be excavated. Will further excavation yield hidden treasures? The exploration began at the northern stelae field. 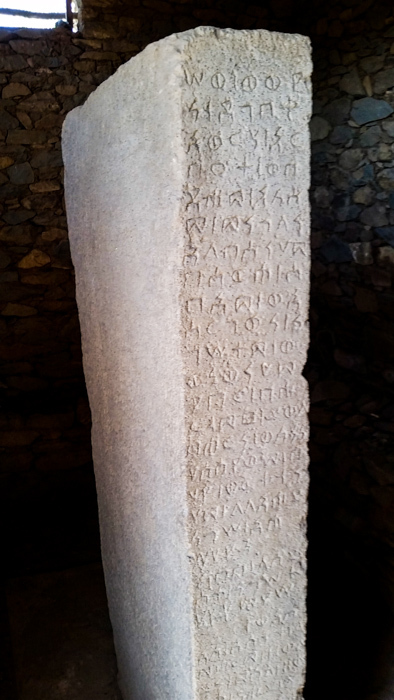 A stela is a monolithic monumental tombstone. 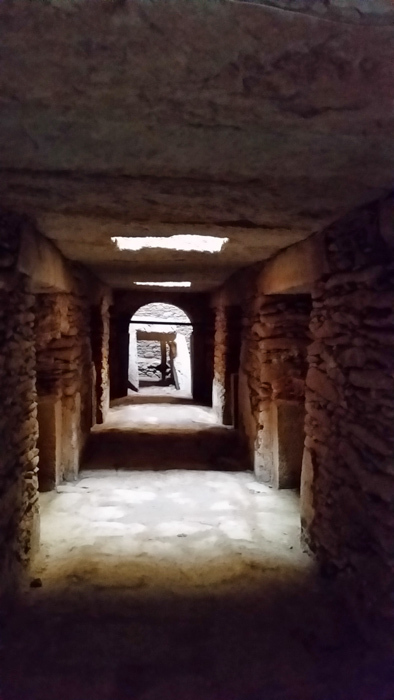 The number of registers indicate the number of horizontal burial chambers. Notice the half moon, the crescent and under it a circular metal plate was placed facing the east. 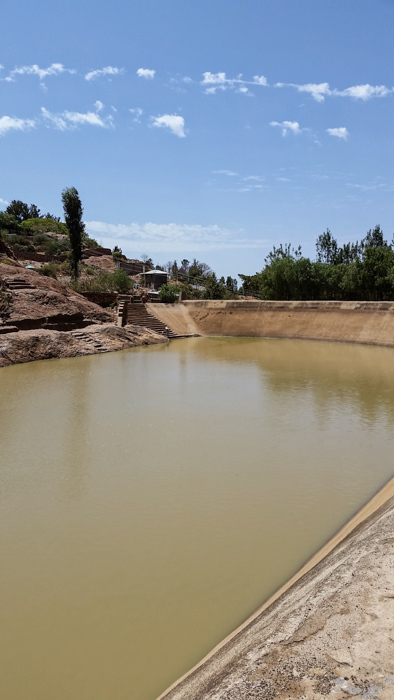 The sun and moon were gods worshiped at Aksum before the arrival of Christianity. 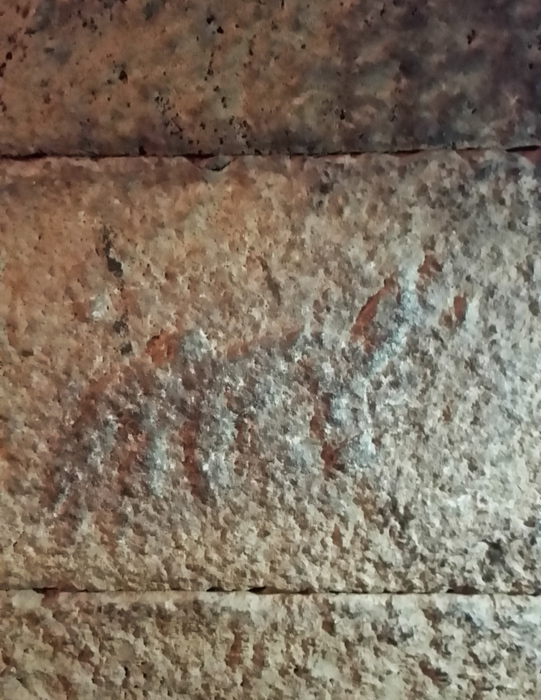 Notice the wild ibex motif. In 340 Emperor Ezana invited missionaries from Byzantium to preach the Gospel so the symbol changed from crescent moon to cross. 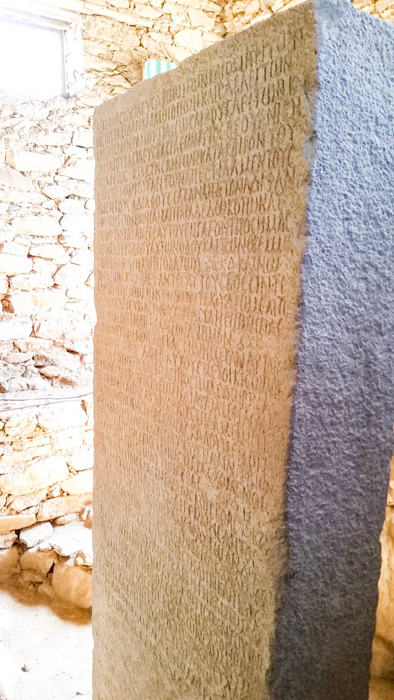 This can be called the Ethiopian Rosetta stone. This was discovered in 1980 when a farmer was plowing his field. It is a monolithic recording of the extent of his kingdom in three languages: Sabean (5-2 century BC), Geez (a language only used in the liturgy), and Greek. 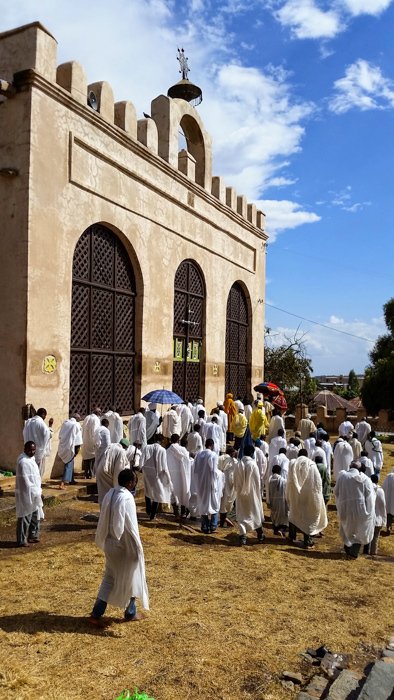 We continued to the palace to the tombs of Kings Kaleb and his son Gebre Meskel. 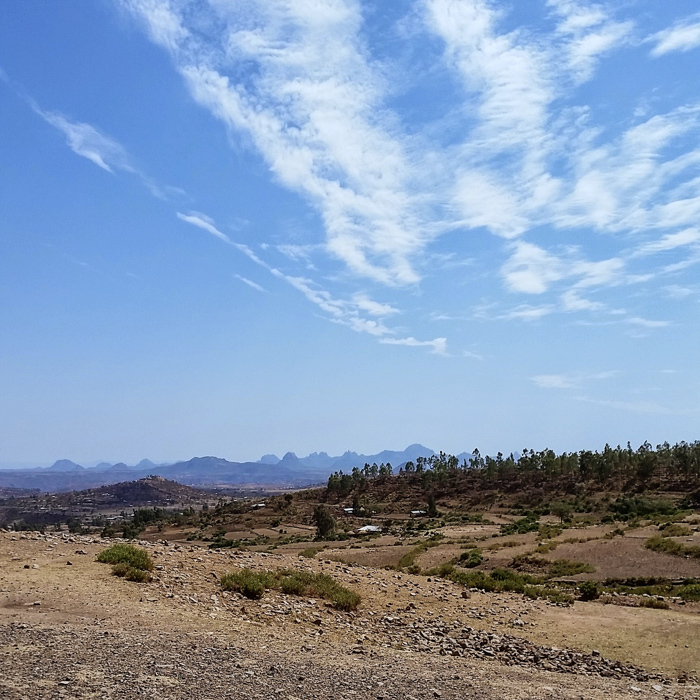 As we approached you have a great view of Adwa where the battle was fought by Menelik against italian aggression. 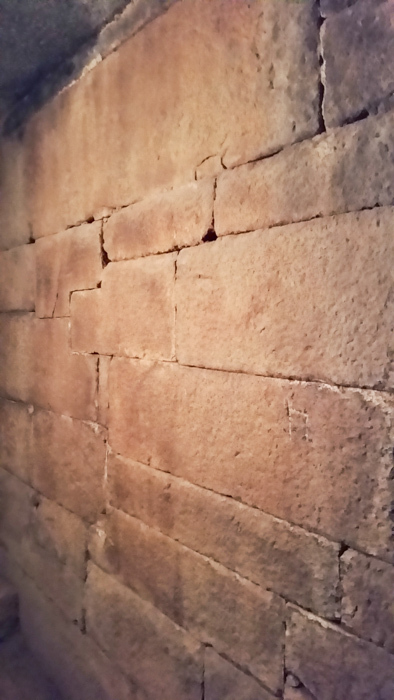 A view of the way the dressed stone is set. Now for a personal experience. Two days ago after lunch when I stepped out of the car a man who was deaf requested alms. I did not have my wallet so I could not give alms. The next day his face haunted me and I prayed the Lord would send another person with a disability to me in Aksum requesting alms. The deaf man’s face and the door of the Promise of Mercy were haunting me. Today as I was ready to get in the car a little boy brought me a man who was blind and requested alms. Thank you Lord for sending him to me so I could offer a token of mercy and compassion. (The bath is not at the palace). Is this the bath of the Queen of Sheba? 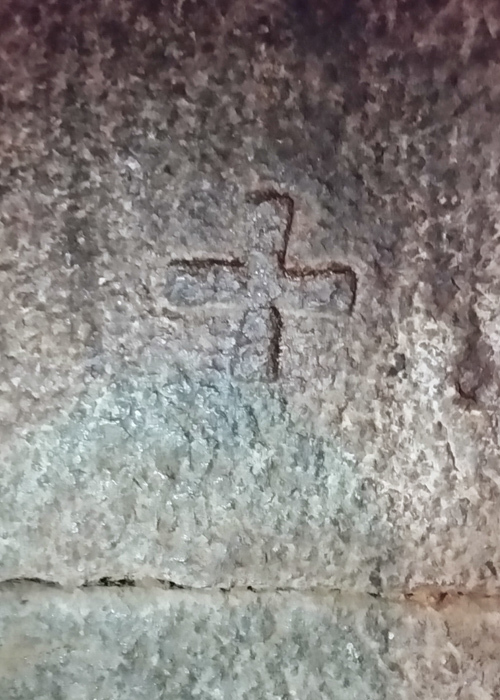 Most likely not since it is only 1000 years old. 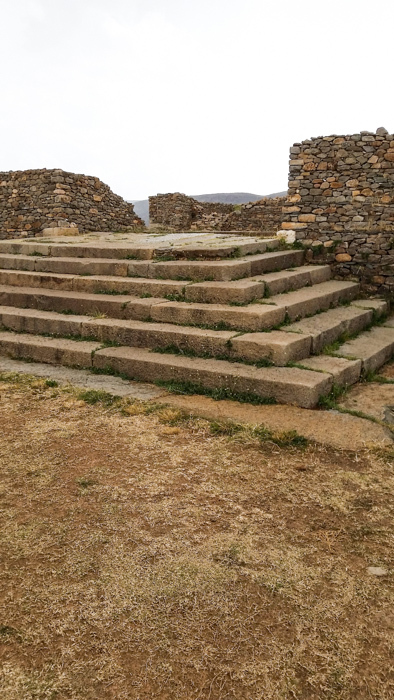 We went to the Dungar Palace that some allege is the palace of the Queen of Sheba. 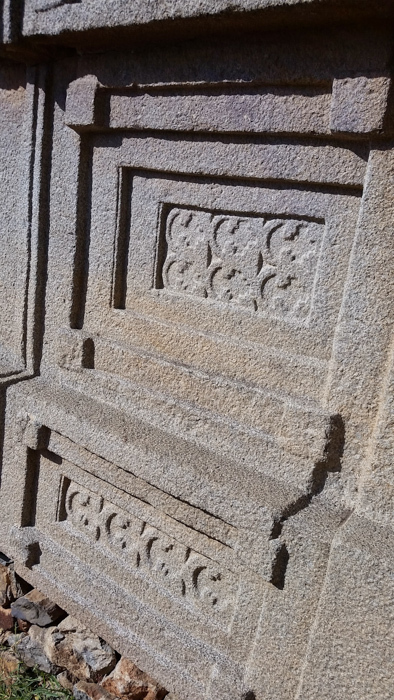 However it dates to the 6th century AD. The most intriguing is that they have excavated and there is a large palace complex from 1000 BC. What is your judgement? 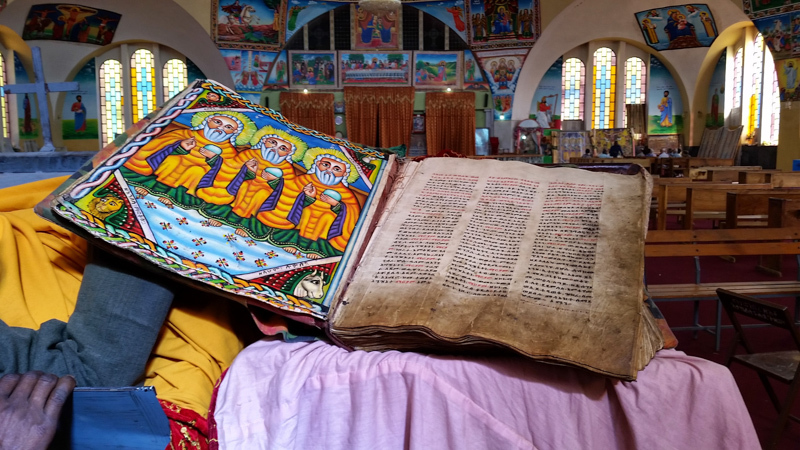 Then on to the center of the Ethiopian religious world whose compound houses a church they claim houses the Ark of the Covenant. 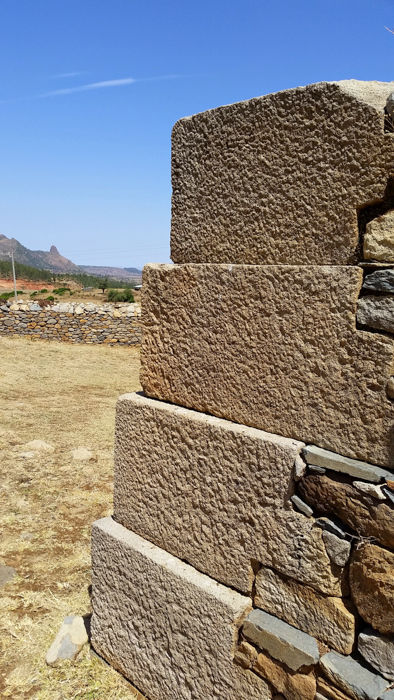 And it was the site of the first church built after Ezana’s conversion. 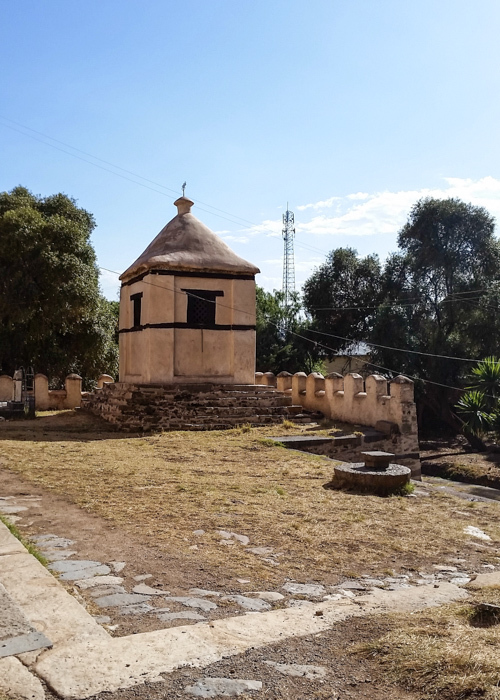 We first visited the oldest church in Aksum built in 1665. I sat there and watched a procession that occurs after mass. They process three times around the church imploring the mercy of God. A deacon gave me a personal tour of the church. 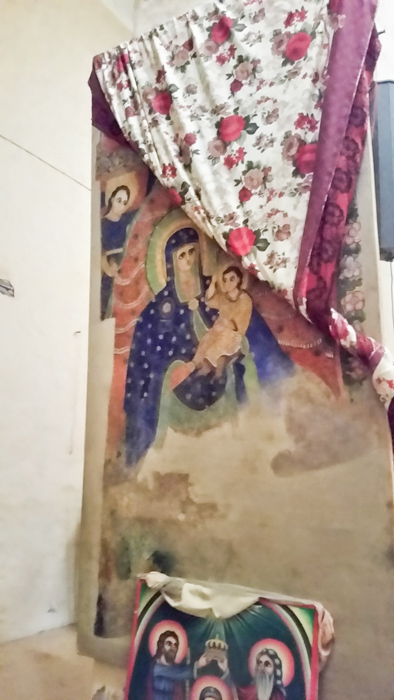 It contains beautiful icons and wall paintings. 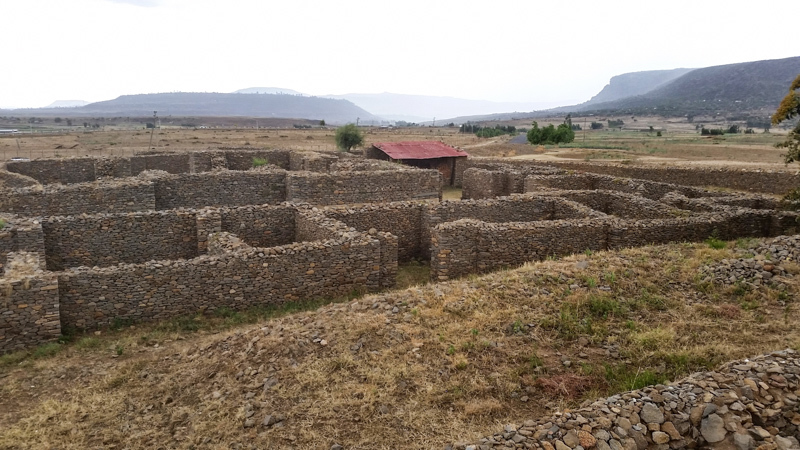 And next to the chapel housing the ark are the ruins of the first church built by emperor Ezana. In front of the church is the circular stone where the emperor was crowned before he was lead into the church. The last emperor to be crowned there was Haile Selassie. This church is restricted to men because behind it is a hermitage of monks who are cloistered. They vote who will be the monk to approach the Ark of the Covenant housed in a shrine to the north of the church. It is a life long position. Each day he enters and prays while offering incense. This is the photo of the shrine. Then the procession moves to the modern church so the women can join the litany imploring the mercy of God. I sat there mesmerized by the beauty in an attitude of thanksgiving that the Lord answered my prayer and sent a blind man to me requesting alms. 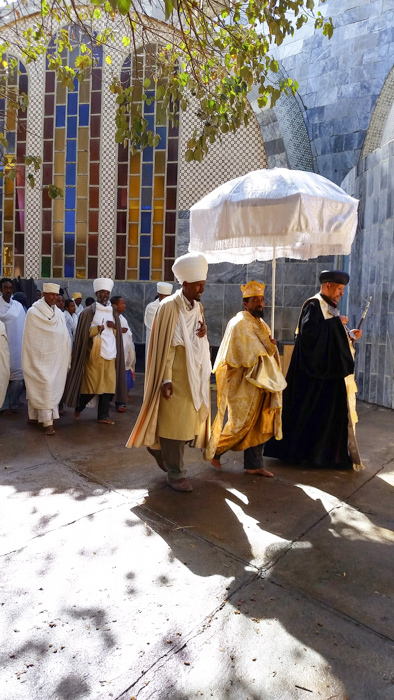 As the afternoon moved on I lingered and was caught up in the fact I was really at the heart of Ethiopian orthodoxy. 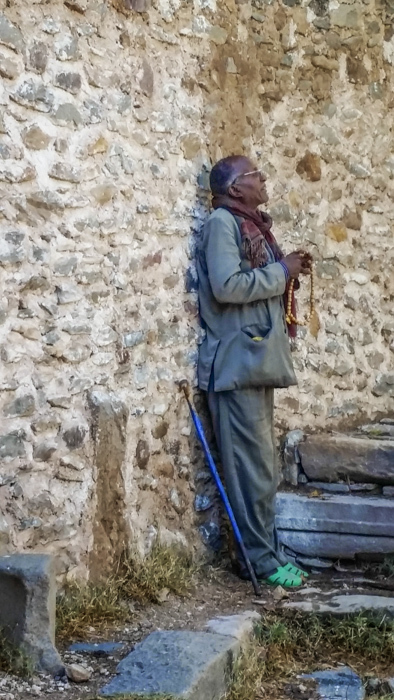 I looked and saw this man caught up in prayer as he moved his fingers over his rosary. I went back into the courtyard in front of the church and there you the king was crowned before entry into the church. And then saw this monk approaching the presence of God in order to pray. 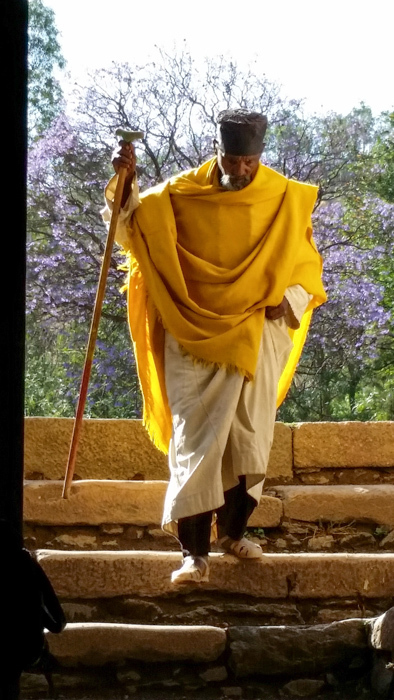 When I saw the monk walking to the church I knew I was at the heart and center of the Christian life: prayer. “Pray without ceasing.” [1 Thessalonians 5:17]. 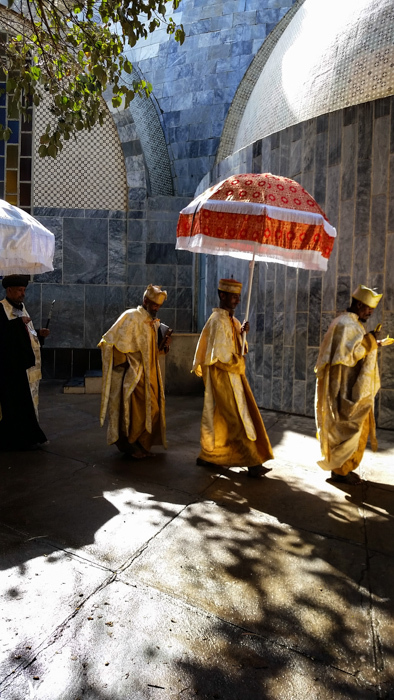 This entry was posted in Faith, Travel and tagged Christianity, Ethiopia, monks, Orthodox, procession, travel on March 23, 2015 by frjfkauffmann.